Disney Movie Club is a great way for your family to grow an awesome movie library. And, not just any movie library, but one that Walt Disney would be darn proud of. Partner that with the fact that in the long run you’ll be snagging the best selling Disney movie titles for pennies on the dollar? Yes, please, right? Check out my entire Disney Movie Club rewards review in this post. You’ll be able to tell if this movie club is for you. What is the Disney DVD Club? I am a huge proponent of saving money here and there on minor things so that you have money for the bigger things — the trips, the kids shoes, cars, etc. That’s why Disney Movie Club fits into my frugal lifestyle. Movies have gotten expensive and this is a way to get highly sought after Disney movies for less. The Disney Movie Club is a paid membership program that makes building a Disney movie collection easy and affordable. If you want to save money on Walt Disney movies, and your family likes Disney movies, or you’re looking to build your child’s Disney movie collection, the Disney Movies club is a great option. Want to skip my Disney Club Movie review? Sign up here. How do you signup for Disney Movie Club? If you do these things, you stand to walk away with eight or even more new movies at around $12 a piece, not too shabby considering that the regular price of movies like this is $20-$30 each! And, that’s assuming that the movies are even out of the vault when you go to purchase them. What am I agreeing to if I sign up for the Disney Movie Club? When our kids were little they loved watching the same movie over, and over, and over … and over. So, this gives plenty of time to pick their favorites. ** One tip: when you buy a movie at regular price from the Disney Movie Clubs, make sure it’s eligible to count toward your commitment. If you’re ever not sure how many more movies you’re on the hook for, simply login to the Disney Movie Club site, click on the commitment tab and you’ll see them there. Once you’ve reached your minimum purchase and and after 30 days, you’ll become a Disney Movie Club VIP member where you’ll continue to get amazing pricing, special offers and more discounts. Or, like I mentioned above, you can simply cancel at that point. It’s up to you! 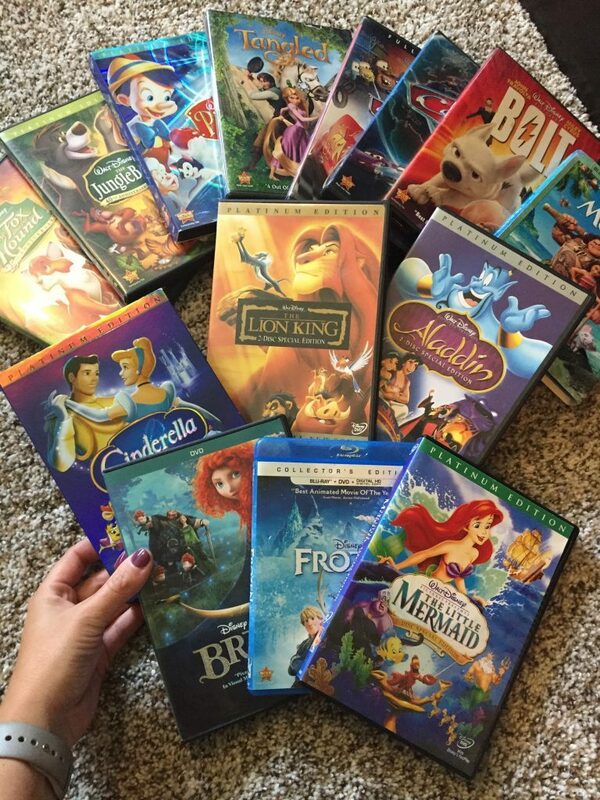 Do I have to be organized to get the Disney Movie Club to work out well for my family? Every four weeks or so, Disney Movie Club will try to send you a featured title, and at that point you have a decision to make. If you DO want to buy the featured title, do nothing. Disney Movie Club will mail you the Blu-ray or DVD and bill you. But please be warned – these do not count toward your membership agreement. If you DON’T want the title, you must respond in the portal that you don’t want the featured title that month. You have three ways to decline the featured title. Enter your decision on the website in the portal, via the automated phone system, or fill out and return the mail response card to skip. If you don’t skip though, you will be charged. The reason that Disney Movie Club does this is that there are indeed people who do want the newest DVD movie upon release each month. And, that’s awesome. If you’re not one of those people, just remember to skip. Is Disney Movie Club worth it? The Disney Movie Club is definitely worth it! Especially if you’re building your movie library, you’re organized via email and can remember to either complete your minimum requirement early on in the program, or your family really likes watching movies often. While you could try to find DVDs individually via Amazon, eBay or other online retailers or in stores, you likely won’t be able to find every movie, and you definitely won’t be able to find every movie very easily. The Disney Movie Club really is a pretty cost-efficient way to find the Disney titles you know and love, and build a collection for yourself or your little ones. Sign up here if you want to try it out! Is Disney Movie Club legit? The Disney Movie Club is legit and is a great thing if you and your family fit into the points I mentioned above. Does Disney Movie Club Charge monthly? No, there is not a monthly charge for Disney Movie Club, you will just want to make sure to to decline the featured titles and fulfill your purchase requirement to get the best deal on Disney movies. Does Disney Club accept Paypal? Disney Club unfortunately doesn’t accept Paypal, but you may pay for orders with check or money order, or credit card. When you join the Disney Movie Club, you provide information regarding your preferred credit card for billing purposes. Your credit card will not be charged until the date of shipment on the movies that you choose. What does Disney Movie Club cost? You pay the cost of the movies and the shipping and processing charges specified in your introductory offer. So after the introductory offer of 4 movies for $1, the price changes, of course. By accepting the introductory offer, you agree to the terms of membership specified within your enrollment agreement, including the purchase of a minimum number of titles at Club prices. Regular Club prices start at just $19.95, plus any shipping and processing charges specified in your offer. Unfortunately there isn’t free shipping. But, don’t forget that the introductory offer gives you four Disney titles for ONLY $1, so you’re saving big on the front end! So, this means that a minimum, you’ll spend $1 plus shipping and processing on your introductory offer. And, as a part of your purchase commitment, you’ll add at least $19.95 times five movies for a total $100.75 plus shipping & handling. If you walk away from your membership with only those 9 movies, you’ll end up spending under $12 per movie, which is an excellent price for Disney movies! What does Disney Movie Club do? Do Disney Movie Club movies come with the digital copy? Disney Club DVD and Blu-rays receive the standard definition digital version of the movie in their choice of iTunes or Windows Media formats. The DisneyFile Digital Copy is located on a stand-alone disc and is Mac & PC compatible. Why are there bad reviews of Disney Movie Club online? You have to fulfill your commitment to the Disney Movie Club, and you have to remember to pass on the feature films when they reach out to you. If you don’t pass on them, unfortunately, you’ll be charged. Bad Disney Club reviews are usually the result of not skipping the feature films. Remember, once you fulfill your purchase commitment, end your subscription, unless you want to be eligible for Disney Movie Club exclusives, continual Disney DVD offers, and more feature film offers. How do I cancel or get a refund if I don’t want to be a member of the movie club anymore? You can cancel your Disneymovie Club membership anytime after completing your member commitment, but you do have to complete your side of the deal. If you cancel early, you’ll be billed for the value of the titles from your introductory offer purchase, so you don’t want to do that, it kind of defeats the purpose of the deal. After you’ve completed your end of the deal, and once you’ve canceled, check to make sure you got a confirmation in your email and you’re good to go. Pay attention and be an active member, check your emails and set a date on your calendar alerts to log into the portal. Order several Disney DVD movies at a time to save on shipping. Cancel your membership once your requirement is met and start fresh. This one sounds a little off, but several current and past members swear by it, and it’s a great way to continue building that Disney movie library! Take advantage of the Disney Movie Club refer a friend program: Did you know that after you’ve completed the Disney Movie Club sign up and and a Disney DVD Club member, you can get two free movies just for referring friends to the program? You can even share this post on social media with your referral code if you want. ** Disney Movie Rewards is no longer. This used to be a great way to get one Disney Movie Club promo code or even more in your account for free. Shoot!